The plot was conceived in the anagen stage, deep in the follicles, nestled and nurtured lovingly as the roots began to multiple. They practically hummed with activity, making quick work of assembling coarse hairs. Some were dark, some the color of storm clouds, other fair as snow, incrementally slithering towards the surface. Ted Cruz looked in the mirror and decided to not shave it. Maybe this would make him more compelling to the nation. He wasn’t getting any younger, why pretend? So he left it, letting it slowly accumulate like soot. This had been what the beard had been counting on. The beard did not try to go unnoticed. You really can’t try in cases like this, to trifle with undercover. You must operate in the daylight and hope that people skim over your malice. People were unsure at first. “Is Ted Cruz depressed?” ran a headline. Several liberal elite publications ran polls on what everyone thought about the beard. Approval rating was hovering somewhere in the range of 40%, better than the sitting president. As the beard fledged itself thicker, growing more lush and consistent, like a hedge greening through the adolescent stage, where it’s waist high with noticeable holes. As the beard thickened, an overwhelming percentage of the populace conceded that the beard was good. Headlines were devoted to the reluctance experienced by admirers. The beard supposed it appreciated the attention. The roots spread like ants, busily growing more and more hair, filling in the bare spots near the corners of the mouth, the peachy pucker of the chin. When the beard had grown over the bottom half of his face, Ted trimmed it, sprucing up the exterior, making sure it was even, dabbed it with a bit of oil for sheen. But, unbeknownst to Ted the beard kept growing. The roots adjusted their resources, using the bare amount of folic acid to keep the exterior up and running. Their original efforts of pushing their shafts through the epidermis layer of Ted’s face, getting Ted closer to respectability had been a success, and they began to work their way down, suturing into Ted’s chin and cheeks. Like kudzu the roots of the hair burst through the follicles, slinking their way through the sweat glands and connective tissue. The hivemind of the beard understood that in order to remain unnoticed they must leave his jaw alone, allowing him to still give speeches. They could not censor him. A patch on the left side under his jawline had taken the initiative to wrap tendrils around his jugular, loosely grasping the vein as if the stems of an orchid. The chin hairs followed the line of his throat, cascading over his laryngeal prominence, down the crisp collar of his shirt, and began to work their way into his lungs and gallbladder. His heart was demonstrably absent. While all of this was going on, and it was going fairly slowly as hair can only grow so fast, Ted Cruz was still serving as Senator in Texas. In fact, the beard had made him more visible than ever. It became the focal point of his every move. Not since the Tea Party had he been so popular. Not since the shutdown had he felt so passionate, so fiery. This had been the beard’s goal, of course, when it chose a host to do its dark work, it wanted to go out with a bang. The beard really did look stately. Ted spent quite a bit of time considering it, stroking it thoughtfully. He had been aiming for something a bit like Abraham Lincoln or, rather, like a Republicany Al Gore. A better Al Gore, really. One that believed in God and not climate witchcraft. And why would God make women so beautiful if they were not meant to be decorative vessels containing the blooms of male legacy? He liked to practice phrases like that in the mirror, storing them in his mind for a future Fox News interview. And Fox News was having him on often these days. He was being tapped for a more formal bid at the presidency, depending on how…everything went. Sean Hannity and his hair seemed to want to be friends, and Ted had never been taken so seriously. It was glorious. He soaked up the attention like a rag. Sure, he was starting to notice something was a little off. His throat felt a little fuzzy, but he wrote that off as allergies. He kept tasting shaving cream in the back of his mouth, but that might be the cholesterol medication. He couldn’t stop eating oranges, so much so the enamel was starting to wear away at his teeth, but what did dentists know anyway? The exhaustion was just stress. Nothing to be alarmed about. Even the most wacky portions of conspiracy Youtube wouldn’t guess that Ted’s blood was having a hard time navigating the rapidly narrowing veins as his body matted with hair. The beard finished the job at a rally. Ted was in the middle of a moving speech on immigration, preaching about the dignity of his father who fought tooth and nail for his son to grow up to be a shallow, self absorbed racist. His voice pinched and musical like a misogynistic kazoo. 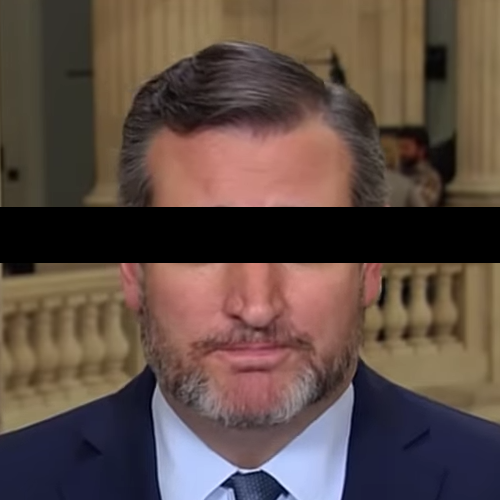 The strands cocooning his jugular pulled taught, the hair that had worked their way through the sponge of his lungs pushed deep until there was no room for air, and Ted Cruz crumbled under the power of his beard like an English Manor under ivy. The autopsy indicated Ted Cruz’s insides looked like the exterior of a rambutan, his extremities fuzzy like a coconut with concentration of hair in the torso and vitals. His throat looked like a kiwi, and the coroner, a poorly educated man who had failed to become a cop, had no idea what was wrong with the former senator. He actually grabbed a clump in the senator’s liver but the roots were too deep and he couldn’t get it free. The structural integrity of the senator had been compromised. The beard still looks beautiful, though, and when they buried him, it was oiled, and trimmed, and smelled faintly of rosewater and lavender.